Getting users to download your app is hard and expensive. Engaging them is even harder. This is why retention is increasingly critical, yet there are powerful strategies that help apps solve this challenge. In this webinar, we'll examine some of these proven strategies to help you increase retention and revenue. 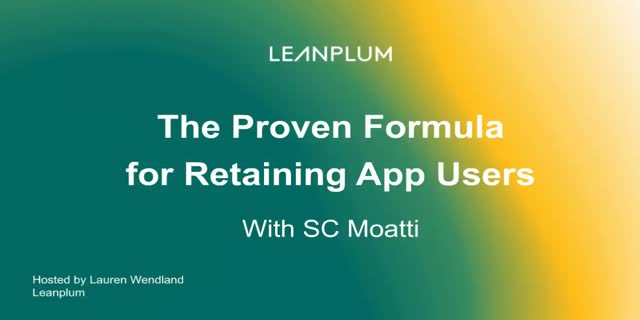 Our special guest, SC Moatti, a technology visionary, venture capital investor, and bestselling author of "mobilized" will share her expert insights on mobile engagement and retention. 2016 is quickly coming to a close and if you haven’t already, it’s time to start looking ahead to 2017 and how you will crush the challenge of measuring mobile app ROI. We’re sitting down with leading mobile brand, Publishers Clearing House, to discuss 2016 app trends and lessons learned — and how they’ll apply those to their 2017 strategies. Growth is the major buzzword in mobile. Yet, what does it mean to grow your active user base if you can’t effectively engage and retain those users? The challenge many mobile apps are now facing is how to keep users once they’re onboarded. It costs more to acquire new users than it does to retain existing customers, however, it’s not easy to scale growth with retention. We'll take a deep dive into the findings from out last two data science reports to better understand what factors affect app engagement. Specifically, we'll examine four key elements: platform, content, delivery type, and geographic region. If you can effectively personalize any combination of these factors using our tips and tactics, there’s a good chance you’ll see high user engagement. Each mobile touchpoint throughout the customer journey presents unique challenges and opportunities. That’s the key to mastering mobile lifecycle marketing: different strategies for different customers at different times. During this session, we'll highlight real-life scenarios based on actual use cases. We’ll review each situation, then lay out the most effective tactics and tips to optimize each lifecycle stage. Each webinar session will focus on a different area of mobile marketing with the goal of educating attendees on how to make informed decisions when it comes to their mobile strategies. In most webinars, we’ll be joined by industry leaders from brands or research organizations. They’ll provide a fresh perspective and first-hand knowledge about lessons learned and pitfalls to avoid.